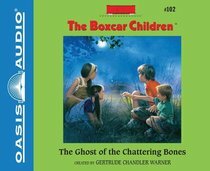 About "The Ghost of the Chattering Bones (Unabridged, 2 CDS) (#102 in Boxcar Children Audio Series)"
Gertrude Chandler Warner, 1890 - Gertrude Chandler Warner was born in 1890, where she and her family lived across the street from train station in Putnam, Connecticut. Warner was sickly as a child and poor health prevented her from finishing high school. During World War I, a shortage of teachers prompted the local school board to hire her to teach first grade, a position she held for over 30 years. She wrote the first Boxcar book in 1942, while home recuperating from an illness, thinking back to her childhood and the train station across the street from her home, and how she had wondered what it would be like to live on a train. The independent Alden children became so popular that Warner wrote 19 adventures about them with titles such as "Surprise Island," "Mystery Ranch," and "Snowbound Mystery." Warner died at age 89 in 1979, but the Boxcar Children are still being written about by a team of writers faithful to Warner's vision. There are now 59 books in the series and eight special mysteries with additional activities in the back, as well as a cookbook. Order now to secure your copy when our stock arrives. Other edition is available. 9781613753736 0 Available. Expected to ship in 4 to 5 weeks from Australia.